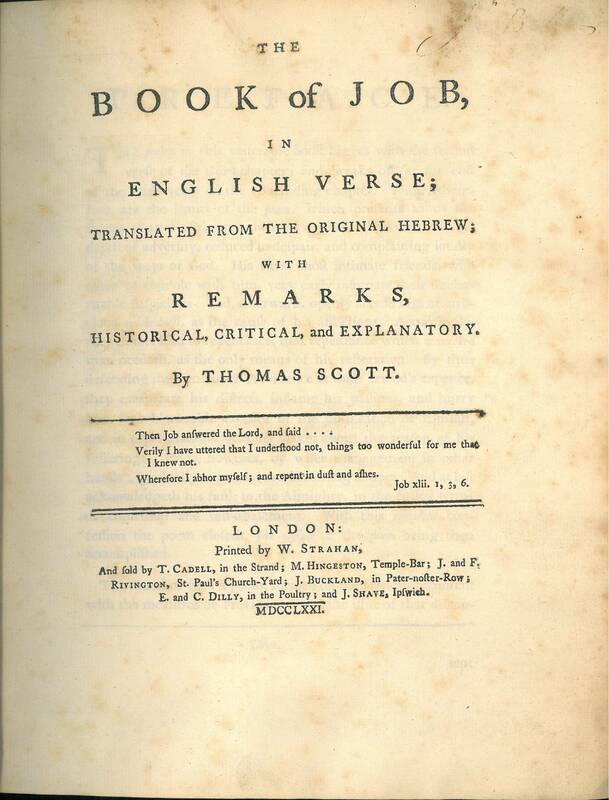 Title: The | Book of Job, | in | English Verse; | Translated from the Original Hebrew; | with | Remarks, | Historical, Critical, and Explanatory. | By Thomas Scott. | Then Job answered the Lord, and said …. | Verily I have uttered that I understood not, things too wonderful for me that | I knew not. | Wherefore I abhor myself; and repent in dust and ashes. | Job xlii. 1, 3, 6. Publisher: Printed for W. Strahan, And sold by T. Cadell, in the Strand; M. Hingeston, Temple-Bar; J. and F. Rivington, St. Paul's Church-yard; J. Buckland, in Paster-noster-Row; E. and C. Dilly, in the Poultry; and J. Shave, Ipswich. 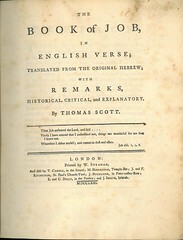 Comments: A second edition was published in 1773 by James Buckland, London.